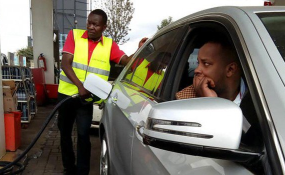 Motorists and commuters in Nairobi are staring at a crisis after some petrol stations ran out of fuel on Wednesday morning with the situation set to worsen. The development has been blamed on a move by oil marketers to refuse to restock the all-important commodity as a protest against the higher prices brought about by implementation of VAT on petroleum products. Along Mombasa Road, operators of the petrol stations we have visited today said they were running out of fuel. One attendant predicted that by 2pm they will be out of stock. At the Total petrol station on Likoni Road, petrol ran out in the morning and only one pump had diesel as at 11:30. In Nairobi, a litre of petrol is retailing at Sh127.8 while that of diesel is at Sh115. The price adjustments were effected by the Energy Regulatory Commission last weekend after a new Value Added Tax on petroleum products kicked in on September 1.